Created and consecrated when Exalted Venus in Pisces was rising in the east, at her own Planetary Hour. powerfully reinforced by a harmonious aspect (sextile) from the Exalted Moon in Taurus - A Venus-ruled sign. Although this specific Talisman was designed and timed to draw and capture the Exalted Venusian essential powers, this piece was also part of a wider, rare and auspicious celestial event which featured 5 planets powerfully positioned in the Zodiac at the same time. 3 Planetary Exaltations: Sun in Aries, Moon in Taurus, Venus in Pisces and 2 Planets in their signs of rulership: Saturn in Capricorn, Jupiter in Sagittarius. This is a truly potent convergence, giving access to an array of highly refined essential planetary powers. Pythagoras, the ancient Greek philosopher (considered the father of philosophy) and his disciples claimed that the entire universe leans on mathematical laws. They believed that at its deepest level, the reality is mathematical in nature and that philosophy is a genuine tool for spiritual understanding. Moreover, they believed that the human spirit can experience unification with the divine and that certain symbols have real mystical meanings. Over time this knowledge was forgotten and “rediscovered” in the Renaissance by men like Luca Pacioli, Leonardo Pisano Fibonacci, and more. Their most revered symbol was the Pentad or the five-point star which was both the key to one of the five platonic solids - the dodecahedron and also the key to the divine golden ration. The Golden Ratio is the mathematical and geometrical law which resonates with the divine law of the cosmos itself. It can be seen in nature and even can be found in music. We, humans, perceive it as beauty and harmony. Our ancient ancestors discovered that planet Venus creates within its movement in relation to the Earth, a pattern of a perfect Five-pointed star/ pentad so venus became the star of beauty, divine love creativity and harmony. 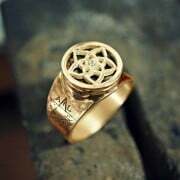 This is the earliest known pentagram ring. It originates from Crotona Italy circa 525 BCE. This drawing was from taken from the book IMAGINI DEGLI DEI ANTICHI by V. Catari, published in 1647. 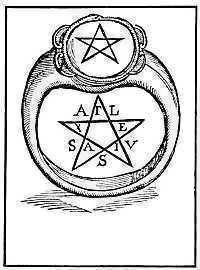 The letters of the word YGEIA (Greek for "health", standard form υγιεια) are inside the pentagram, and the letters of the Latin translation SALUS are just outside. "The disciples of Pythagoras, who were indeed its real inventors, placed within each of its interior angles one of the letters of the Greek word ΥΓΕΙΑ, or the Latin one SALUS, both of which signify health; and thus it was made the talisman of health. They placed it at the beginning of their epistles as a greeting to invoke a secure health to their correspondent. But its use was not confined to the disciples of Pythagoras. 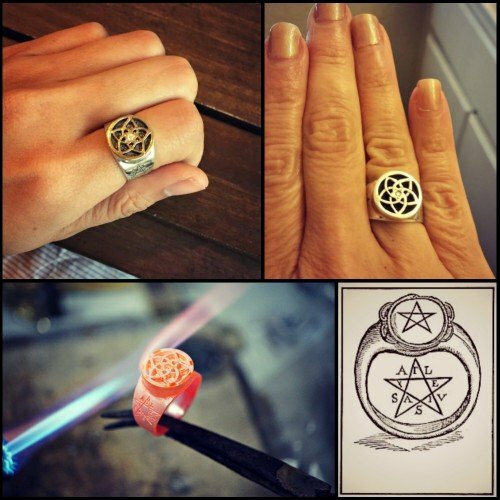 As a talisman, it was employed all over the East as a charm to resist evil spirits." 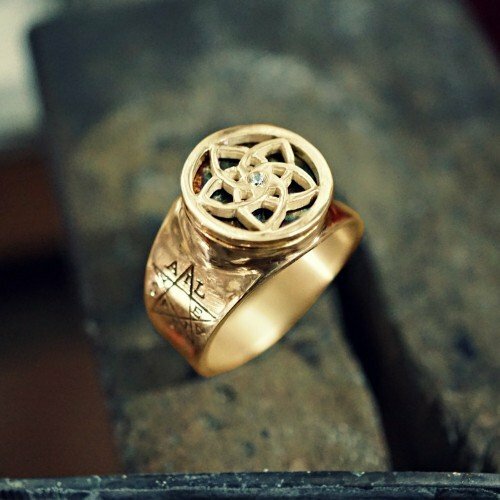 The Pentalpha (Pythagorean) magical ring is a powerful talisman of ancient times for good health and protection.